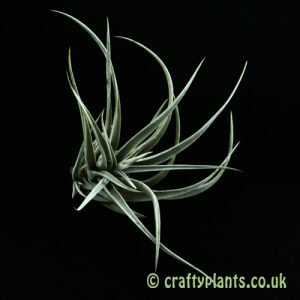 With it’s fascinating shape and robust hardiness, Tillandsia Duratii is almost certainly one of the most amazing of all airplants. 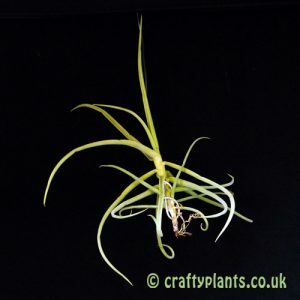 In nature Tillandsia duratii grows suspended from trees in the dry forests of South America. Its panicles of violet blue flowers bloom over a prolonged period and exude a scent that can fill an entire room! 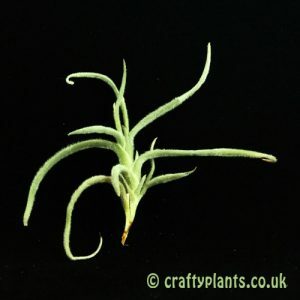 Tillandsia duratii is a must have for any serious collector or anyone wanting a houseplant that makes a real statement. The real ‘care-free’ air plant, Tillandsia duratii has made its home in habitat in a more varied range of locations than most air plants. With a range from 200 all the way up to 3500 metres above sea level. It’s happy growing in a huge range conditions, not too fussy about the intensity of light, water and temperatures its definitely one of natures more tolerant creations. Prevalent in the Gran Chaco, a semi-arid region encompassing areas of eastern Bolivia, western Paraguay and northern Argentina, Tillandsia duratii can be found clambering through the tree canopy. 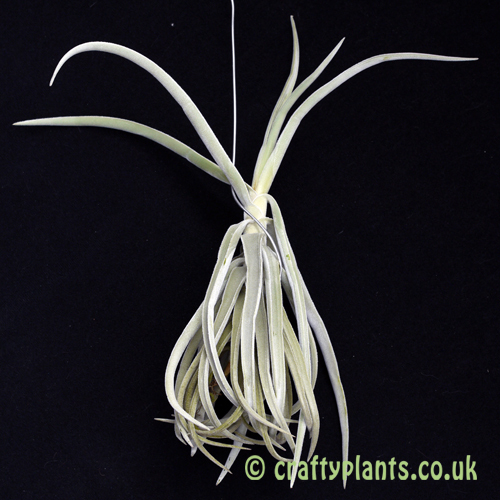 The fascinating style of Tillandsia duratii make it one of the more unusual air plants. In a constant effort to maintain it’s tree top position where it can take full advantage of the sunlight, its leaves curl, wrapping around anything it can almost like sweet pea tendrils supporting the plant in its climb. As older leaves die, they dry out causing the ends of the leaves to form tight ringlets around their host. 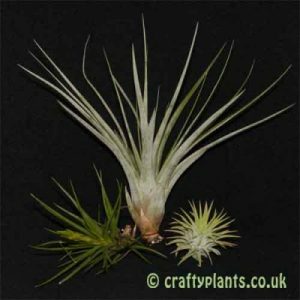 As the trees grows, Tillandsia duratii clambers upward. In the home, the habit of these recurving leaves can be used to great effect, suspending the plant from a piece of wire produces an almost candelabra like appearance as the lower leaves gracefully tuck under the plant. 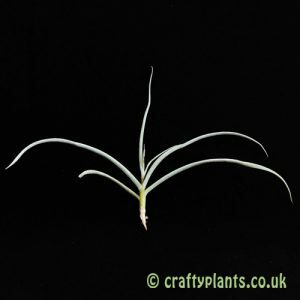 Our Tillandsia Duratii are supplied on wire ready to be hung up and are approximately 12″ (30cm). My beautiful Duratii arrived this morning in wonderful condition. It looks gorgeous hanging on my front room by the window. Beautiful plant!